Several residents are organizing a special improvement district to finance new underground power lines along Nevada Way in order to preserve the view of Lake Mead. File Residents are trying to create a special improvement district to allow a portion of the proposed 69kV transmission loop be put underground. An additional $1.4 million is needed for underground installation for a stretch of the city’s 69kV transmission loop project that would run along Nevada Way past Quartzite Road. 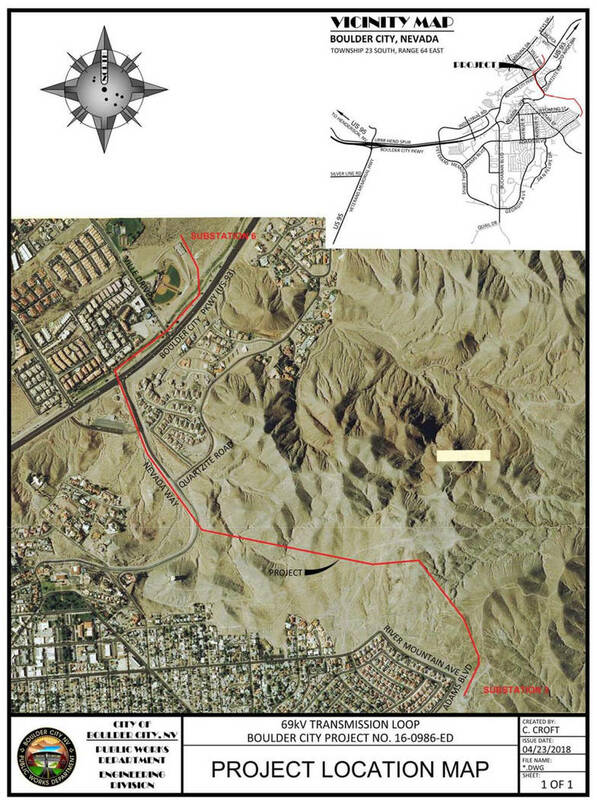 The city approved a nearly $4 million contract with Par Electrical Contractors Inc. in August for the 2.07-mile power line that will run from substation 6 near Nevada Way on U.S. Highway 93 through the desert to substation 1 and provide a backup for distribution substations 1, 4 and 6. The city did discuss installing underground lines in late August but opted not to spend the additional money. At that time, City Manager Al Noyola said any delays with Par could put the approved contract in jeopardy. Cokie Booth and Michael Giroux are among the residents trying to create a special improvement district that will encompass approximately 200 of the properties along the roadway. “The city is willing to listen to our concept. … It really impacts the view along that part in terms of development,” he said. Giroux said they are waiting for a quote from the city about how much it would cost to install 3,000 feet of underground power line on Nevada Highway from U.S. 93 to curve just past Quartzite Road. That portion is a smaller one than the city researched. “We will start having meetings when we get that quote,” Booth said. She said they also plan to create flyers to help engage people in the project. “We’re going to move as quickly as practicable,” Giroux said. Booth said they have been working with Mayor Rod Woodbury, Acting Public Works Director Jim Keane and Electric Utility Administrator Rory Dwyer. “They’ve been so helpful and responsive,” Booth said. She said she is getting involved because the view is beautiful and a part of Boulder City. “The line won’t affect my house, but it will affect the view and the property values there,” she said.